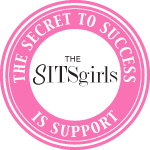 I decided that since I would have such an awesome blog to write this week that I would hope you would all understand why it was late and that it is totally worth it! For sometime now, Dale and I had decided that we were going to book a room at Seawind Landing. We figured we would splurge on a package for our anniversary and most likely rent a car for travel. Where we usually never go anywhere on vacations and what not, we really could use it. However, before we get to Sunday’s adventure, we shall start with Saturday night. So, Saturday started with us having Dale’s father drop us off at O’Regans to pick up a car for our little adventure. We waited around until Mike was ready, made some guacamole, and headed over to Devona’s for a night of fun! We were full from good eats, and had a lot of fun playing Cards Against Humanity and Rummoli. Crashed there for the night, had an amazing breakfast prepared by the talented Devona. We did a little running around, finished packing up and headed out for an amazing weekend get away.So lets start this adventure off with the knowledge that it was snowing a bit and we were in a tiny Hyundai Accent. We made our way onto the 102, then 104 then a whole bunch of terrible roads. This was courtesy of Google Maps telling us this would be the fastest way to get there. Well, it wasn’t. All of those terrible roads were speed limits of 60-90 km/h but you had to go 20-30km/h under the speed limit because the pot holes were so terrible that we thought for sure we lost the right front wheel and that the car may not make it to Seawind Landing. As we grew closer (about 30-45 mins away) they had attempted to call us to see if we were still coming and unfortunately we didn’t have service to call back. Which is crazy, since we almost always have service with our provider. When we finally only moments away, we thought we may have taken a wrong turn. The area is so peaceful and out of the way, that it feels as though you’re driving through someone’s backyard. When we arrive they are waiting outside for us, and took us to our room to get settled and get ready for supper. 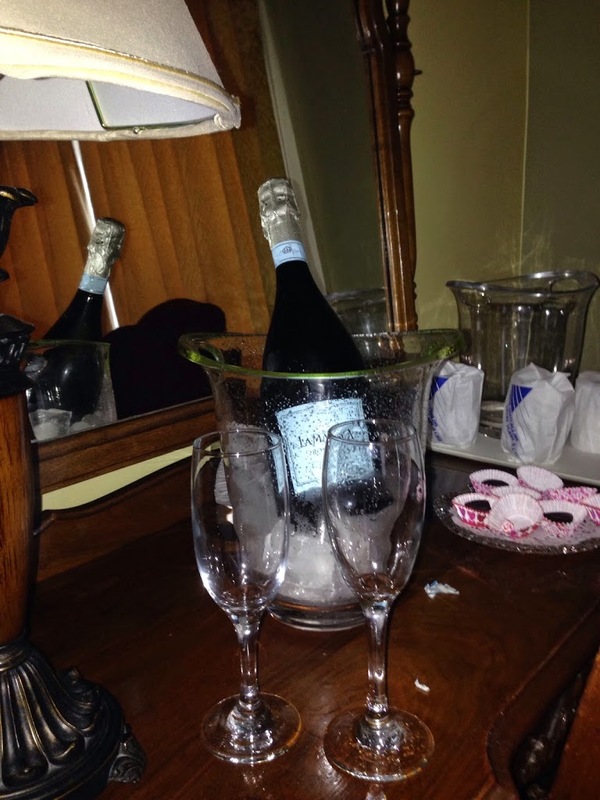 As part of our romantic get away, we received Sparkling Wine (LaMarca Prosecco) and handmade chocolates. 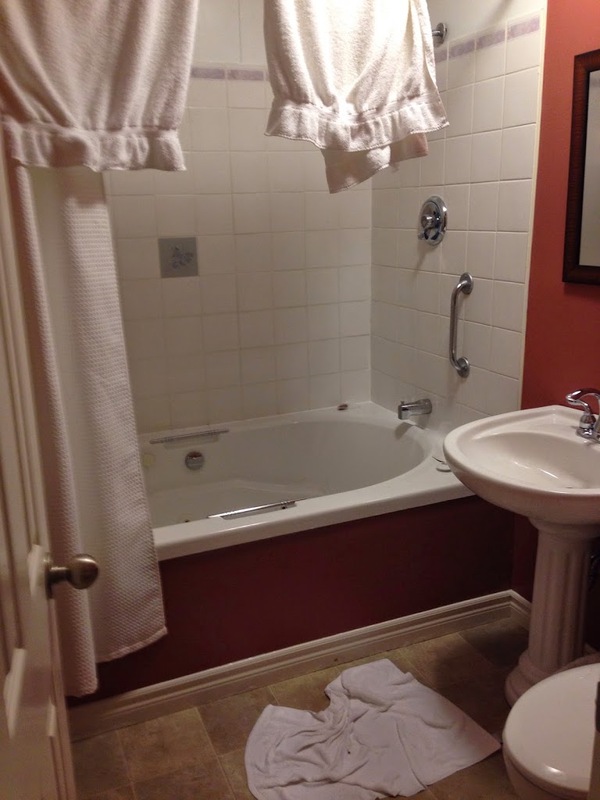 Our room came with a large Jacuzzi tub, and you can guess where we planned to spend the entire time we weren’t eating. Which, is where we headed while we killed time until supper. LUSH and a glass of sparkling wine makes every bath better! 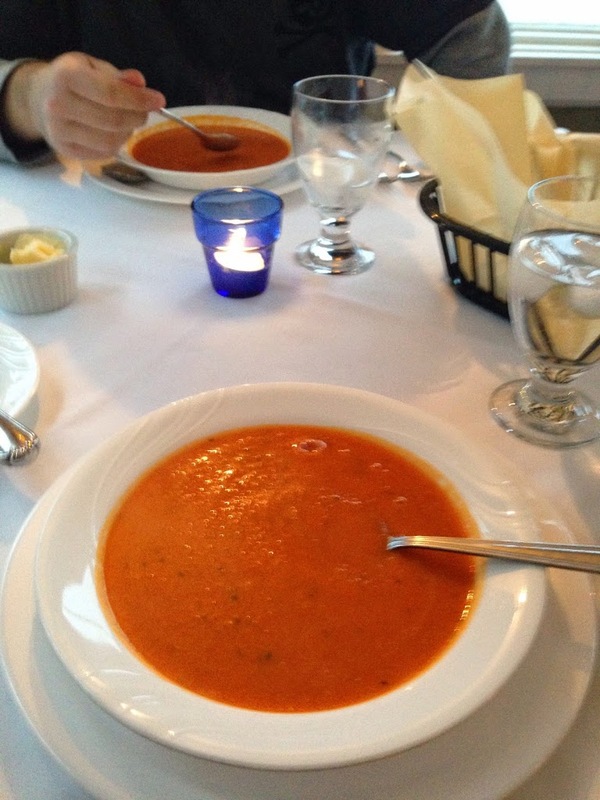 So our four course dinner began with delicious homemade bread and an amazing red pepper soup. 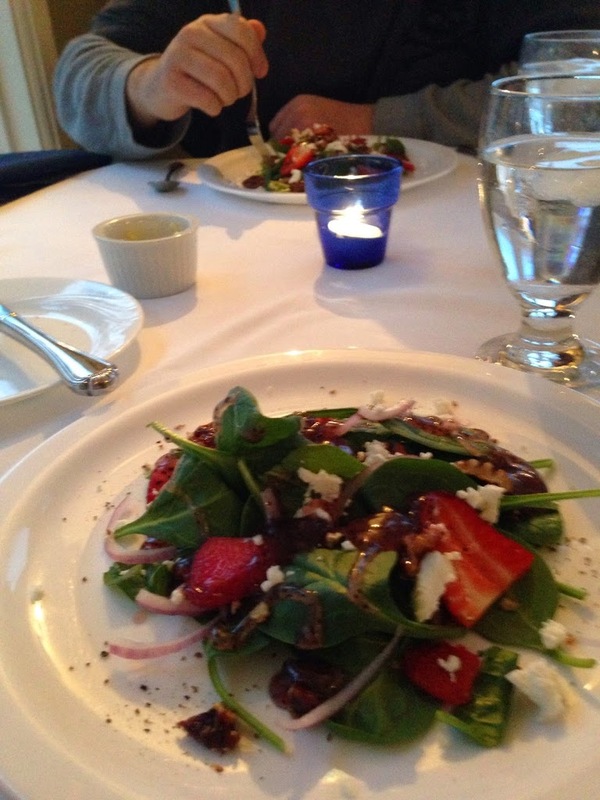 That was followed by the most amazing salad I have ever consumed – Strawberry Spinach Salad. This salad is made with baby spinach, glazed pecans, goat cheese, strawberries, red onion and the best raspberry-poppy seed vinaigrette. This salad is to die for, and I don’t say that lightly. 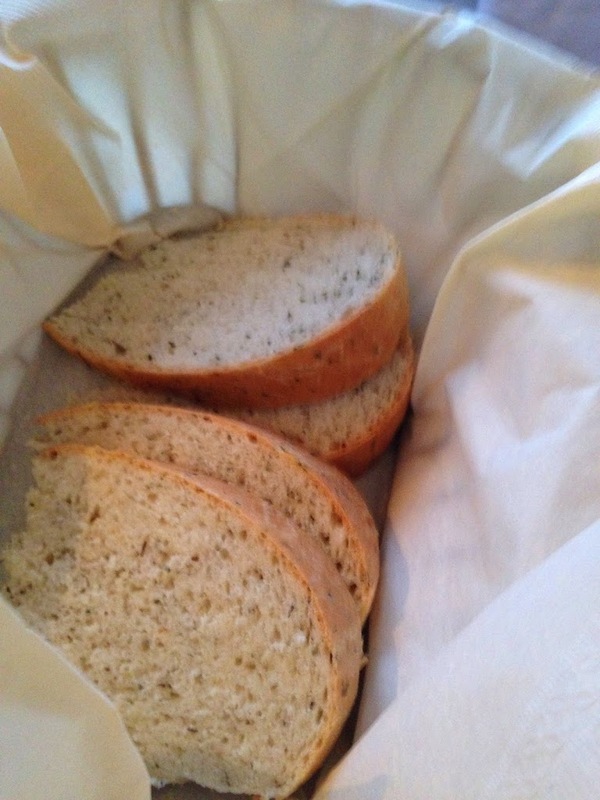 I’m on a mission to find a raspberry-poppy seed vinaigrette recipe that will compare. Go, eat this salad, and die happy my friends! 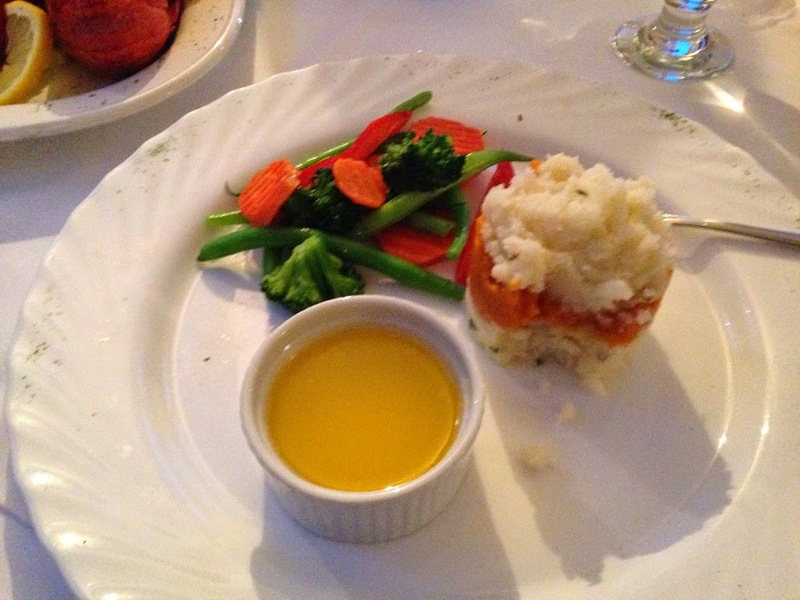 The next portion of our meal was veggies, mashed potatoes and lobster! Which was both exciting and terrifying. 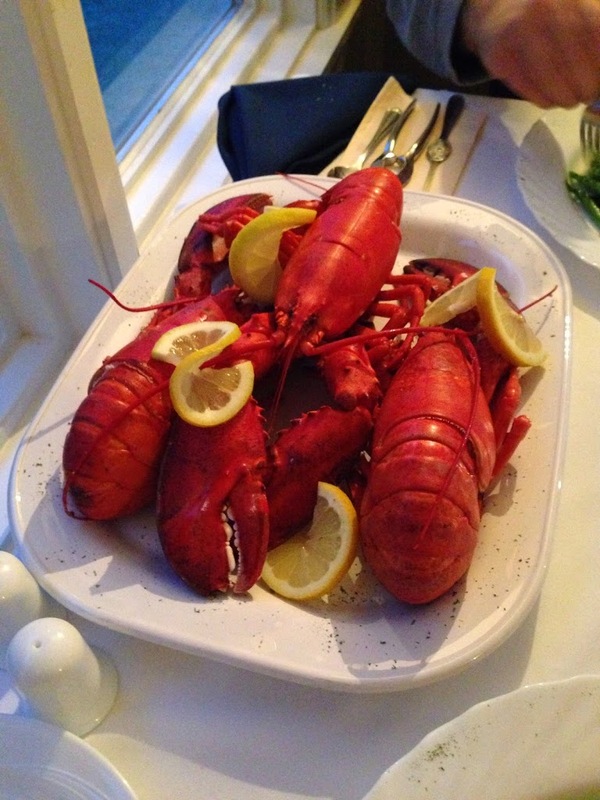 I’m no stranger to eating lobster, but to taking it a part – that is another story! I’m used to having a claw here or there and just opening that. I had full lobsters this time, which thankfully came apart fairly easy but I wasn’t sure all what was consumable on the bodies (and tomalley is disgusting looking anyways). So we ate what we could, and were quite full. Then came along dessert. Sorry folks, I forgot to take a picture – I was too busy stuffing it in my face. However, it was a Baileys crème brûlée. It was the perfect size and was delicious. A perfect end to a meal. Afterwards we discussed meals for the following day (which included lobster pancakes, lobster rolls, and braised lamb)Once we were finished eating, we made our way back out to the main area to visit the dogs. 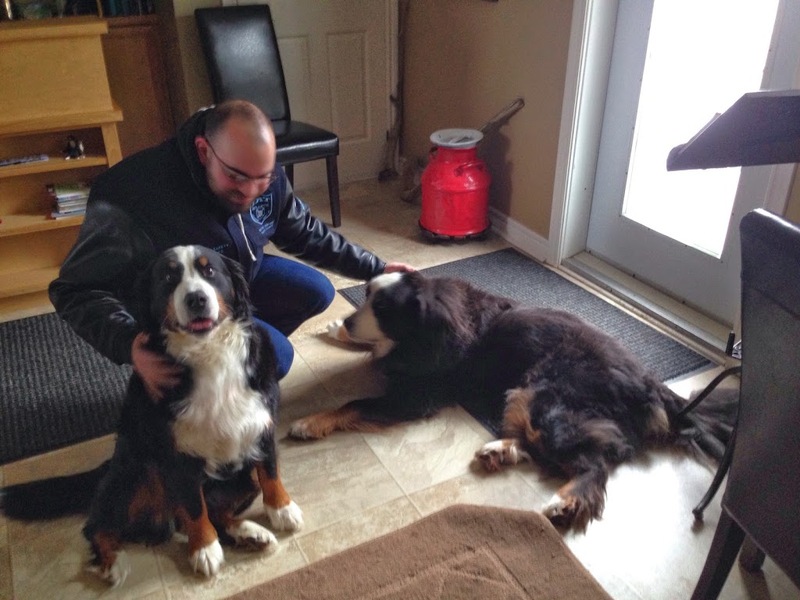 They have two Bernese Mountain Dogs: Beaufort & Emmy Lou. At this time, it was probably close to 8pm and the dogs were tired from the day. However, this did not stop the awesome affection they had to give. We spent some time with them, then wondered back to our room. It was time for another relaxing bath and wiiiiiiiiine! This time it was all about the bubbles and a shower afterwards. We watched a little TV, and cuddled into bed to get some sleep. It had been a long day of driving! The next morning we woke to no power. This was understandable, since it was really windy and icy the day before. We got dressed and wandered over to the main building. We assumed that since the power was out breakfast was out the window, but they had some items ready that they could make. So they prepared us a lovely homey breakfast while we paid Emmy Lou and Beaufort all kinds of attention. First off, many of you know I have fairly annoying allergies to animals (stuffed up really bad, itchy red eyes, skin breaks out, etc), however, I was not affected at all while playing with them. After we ate, they told us which direction to head in to obtain gas and some suggestions for good places to eat lunch since the power wasn’t scheduled to come back until 4pm. We obtained gas, and decided to make a trip to Antigonish pick up some items so we had something to do if the power was out. On our way back we stopped at Days Gone By Bakery & Restaurant for lunch. 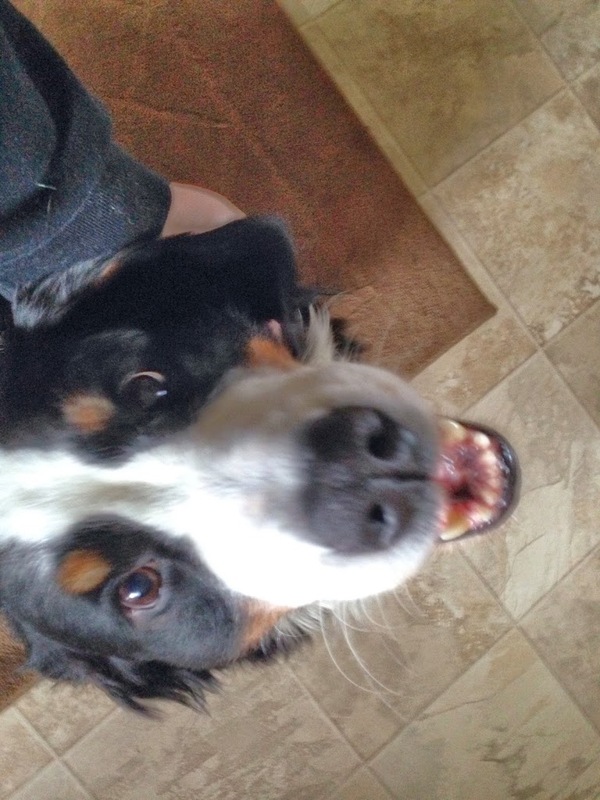 I had a tasty thanksgiving style dinner (turkey, stuffing, mashed potatoes) and Dale had a hot turkey sandwich. After there, we headed back toward Seawind Landing. As we were on our way back, they called us up to update that the power wouldn’t be back until at least 9pm now and wanted to make arrangements for the rest of the evening with us. We told them we would be back soon (and probably lose our service soon too) and we would talk once we got back. 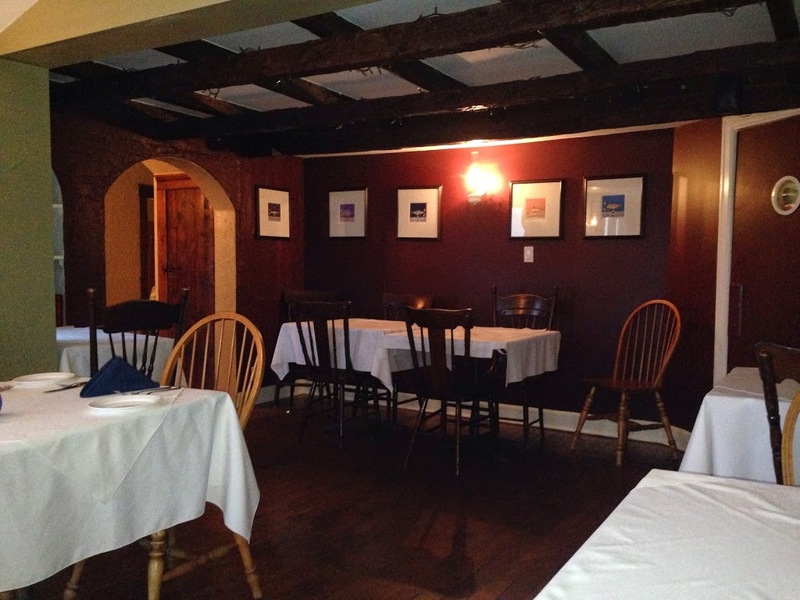 When they got back they had offered to put us up in another B&B in Guysborough since they weren’t expecting to have power back until late. We didn’t want to impose, so we told them that we’d rather stay with them (with no power) if they were fine with that but if not we would go elsewhere. They agreed we could stay, so we just hung out with them and enjoyed some take-out together and shared stories. Around 8:30pm the power came on for about 2-3 minutes, before going out again. After that, the ETA moved to 11:30pm. We headed to our room around 9/9:30pm and cuddled in for sleep. I’ll tell you – it is SUPER dark out there when there is no power at all. Almost horror movie dark. The power must have come on around 11:45pm, but we were out like a light until about 7am. We woke up and were excited that we could have another bath. So we bathed, took a shower to rinse off and started to pack up the car. We came back in and were just killing some time before heading over for breakfast when the power went out again at about 8:30am. We weren’t too concerned, since we could just stop and grab something on the way home. So we grabbed the remainder of our stuff and headed outside into the snow. It had decided to snow over night and make a mess. Our first hurdle of the day, was trying to pull over to the main office. We got stuck in the snow and had to eventually go over to get help. It was an easy fix and just a gentle push to get going after that. Once we walked into the office, we had the best greeting of life from Emmy Lou and Beaufort. Attention all around for the pups! Where there had been power in the morning, they had enough time to get everything set up and we ended up getting to have breakfast after all! 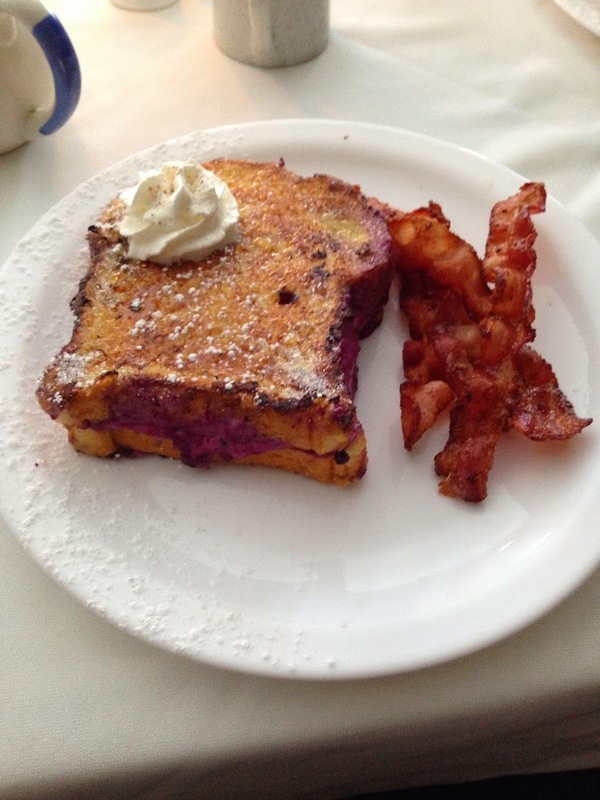 It was fantastic, we had blueberry stuffed french toast brûlée and bacon. Oh god, it was heavenly. So delicious and creamy, best way to end our stay! We had a chat with Dave and Ann Marie (Inn Keepers) just before we left as we paid lots of attention to Emmy Lou and Beaufort. They were the most amazing hosts and we will definitely be back again in the summer. We promised, in fact! Dave ended up following us for a bit to make sure we didn’t get stuck again (and we did, trying to go up the hill to get on to the main road). It took some time, but we figured out that it was the anti-slip function of the car that was causing issues because as soon as it felt like it was slipping it would stop feeding power to the tires.After that, it was smooth sailing. Had to stop a few times on the highway home since the wipers kept freezing and we couldn’t see. But other than that it was great trip. I can’t wait to go back, they are amazing people and in such a beautiful location!